The Renaissance was a time of growth and change, hundreds of people changed lives in Europe, but none so unusual or magnificent as Isabella d'Este. She was born into the rich and noble house of the Estes in 1474, a year before her younger sister Beatrice. From birth their lives seemed not parallel, but intertwined. When Isabella was born she was welcomed by her parents, the court, and the public, as the Este's first heir. Then a year later Beatrice was born, she was not welcomed, they had hoped for a son to take control when his parents could no longer rule. In the years that followed Isabella had three more siblings, all boys. As they grew it was apparent that Isabella reigned supreme in the household. She was surprisingly witty, wise, and intelligent. She was graceful and musical and was gifted at dancing and sewing. In 1480 Isabella was proposed to accepted engagement to Francesco Gonzaga. Francesco was known as one of the most fascinating, yet ugly, man in the known world, he was a brave soldier and a complete gentleman. Isabella was known as loving and loyal, she would be a wonderful addition to the Gonzana family. But then she was proposed to by Lodovico Sforza, this marriage would have expanded her family's amount of ownership and let her live a life of luxury. Once Lodovicho realized that she was already engaged he quickly withdrew his proposal so not to dishonor or insult Francesco. Then he married Isabella's little sister, Beatrice. Most marriages of this time were not meant to be because of love, rather it was a joining of two families for more political reasons. But Isabella and Francesco were different, they loved each other. Francesco was attracted to her charm and vigorous youthfulness, and she admired his courage and strength. In 1490 they were married. The ceremony lit up the day, every one from surrounding kingdoms was there. They spared no expense on their wedding and made it remarkably beautiful. Isabella loved Francesco's family and she was welcomed in by her loving in-laws. Isabella seemed to have a wonderful life, except for continuing troubles with her sister. Beatrice and Isabella had been different ever since they were born, and now their differences got in their way. Beatrice's accent on luxury was far to great. People found her eighty-four new dresses, heavily embroidered with gold thread, jewels, and pearls far to excessive. Beatrice had too many rooms filled with silver, ivories, precious glass, paintings, and perfumes. She played little tricks on people to get more attention. When Isabella learned of these things she was furious with her her sister. She was ashamed to be her sister, and hated what her sister had turned out to be. 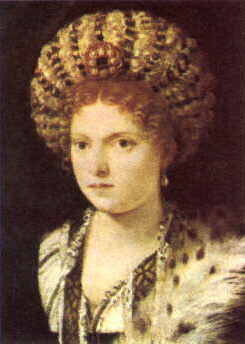 But this was only the beginning, at one point they both had children, Beatrice had two boys while Isabella had two daughters (Eleonora and Margherita, she later had two more daughters Ippolita and Paola who joined a convent**), Beatrice was ruthlessly cruel to Isabella because she didn't have a son to take over when Francesco died (later she did give birth to three sons, Frederigo, Ercole, and Ferrante**). This angered Isabella so much that she never visited Beatrice again. The last time Isabella saw Beatrice was at her funeral, Beatrice had died soon after her third son (who was stillborn) was born. Isabella cried true tears but not prolonged, her sorrow was contained and she soon got back to the matters on hand. A patron of the arts and a strong woman Isabella was now to face the most trying thing in her life. 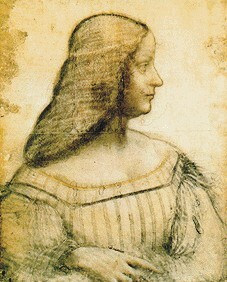 About eleven years after the death of her sister Francesco was captured by the opposing side in a war, the year was 1509. The enemies thought they would win indefinitely because they had the leader of the whole Mantua troops. Knowing something horrible would result if nothing was done Isabella herself took control of the troops and ordered them to keep their ground even if they threatened to kill Francesco. Meanwhile Francesco was sick in a war prison waiting to be liberated. Eventually Isabella got the enemies away from the borders and saved Mantua, then she negotiated the release of her husband. Francesco died in 1519 and Isabella was heart-broken, but as with her sister she was able to contain her grief and pull through a strong woman. The same year, at 44 years old, Isabella took control of her city-state. Her eldest son, Frederigo, was overwhelmed by the fact that his mother was ruling Mantua. And when he was married and old enough to rule he took the power out of his mother's hands, Isabella then took the role of an elderly woman. She left Mantua, wanting to travel without being tied down by being a wife or ruler. Then Mantua began to have problems. Without Isabella Marquis didn't know how to run the city-state. He begged his mother to return and this made her want to stay even more, she felt wonderful in the cities that greatly welcomed her. She sent back ideas on how to run the city-state and manage the people, and with this Marquis improved and saved Mantua. Now her son's future was secure and safe she had accomplished everything that she was destined to do she could relax for the last five years of her life. On February 13, 1539 she died, at 65, quietly and at peace. Her influence was noted down in history, and it improved lives of the people she ruled and the families she lived with. And she will always be remembered as the prima donna del modo - first lady of the world - for Renaissance Italy.